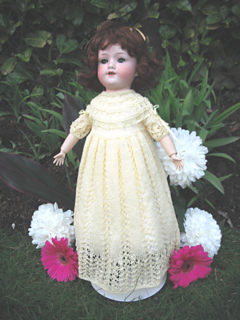 A long lacy Victorian style dress to fit a doll approximately 18” tall. Trimmed with matching ribbon and bows. Measurements: To fit a doll approximately 18” tall with 11” chest. The length can be adjusted to size. Materials: approx 40g (400m) 2 ply (laceweight) cotton or acrylic yarn. A pair of size 2.75mm needles, and a circular needle or a set of 4 double pointed needles size 2.75mm. One metre of matching ribbon 4mm wide. Long lengths of waste yarn to use as stitch holders.